Halloween is here, so that means it’s time for fun and spooky treats! 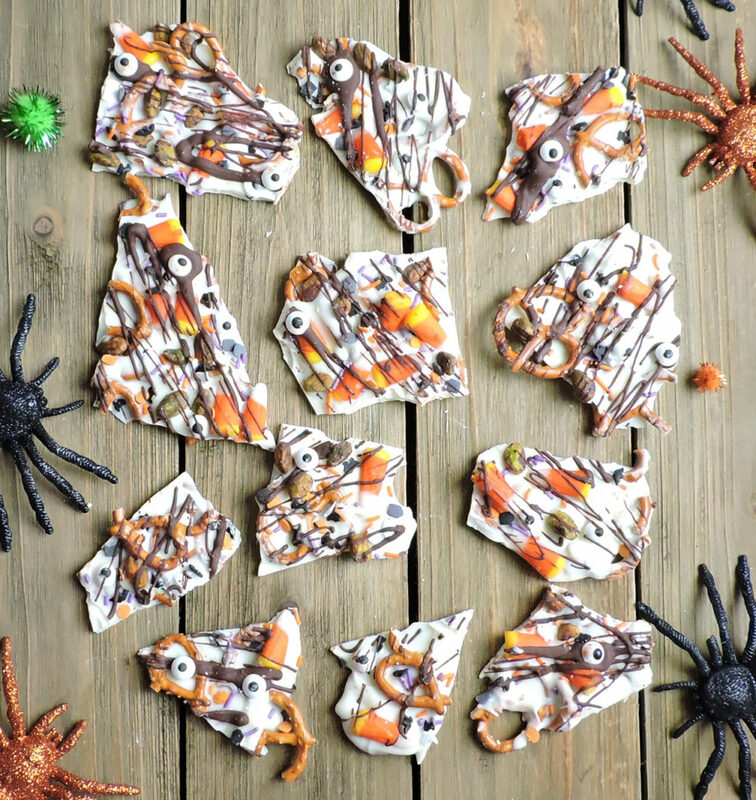 This Halloween Pistachio Bark is the perfect treat for the kiddies or for yourself! Happy Halloween everyone! It’s finally Halloween, so you know what that means?! Time for all things scary!! (Cue the scary music!) Personally, I’m not a big fan of the scary stuff! I enjoy going to the fall festivals, eating candy apples, and dressing up like a princess! Yes, adults can still dress up for Halloween too! Lol! Why should the kids have all of the fun, right?! ? If you haven’t guessed it by now, I’m the cheesy mom that likes for her family to have matching costumes! I think it’s the cutest thing ever!! My husband absolutely HATES it and calls me lame! Lol! I don’t let that steal my holiday spirit! Little does he know, we’re all getting matching Christmas pajamas this year too! That’ll teach him to call me lame! Lol!! I enjoy this time of year, because I love making treats for my family! My kids get really excited when they see bags of candy corn, sprinkles, and eyeballs in the kitchen! Lol! They know that something great is about to come shortly after! I love to see them hover around the kitchen, waiting in anticipation for “mommy’s cooking.” That’s what my 3 year calls most of my food dishes, “mommy’s cooking!” It melts my heart every time he says it! 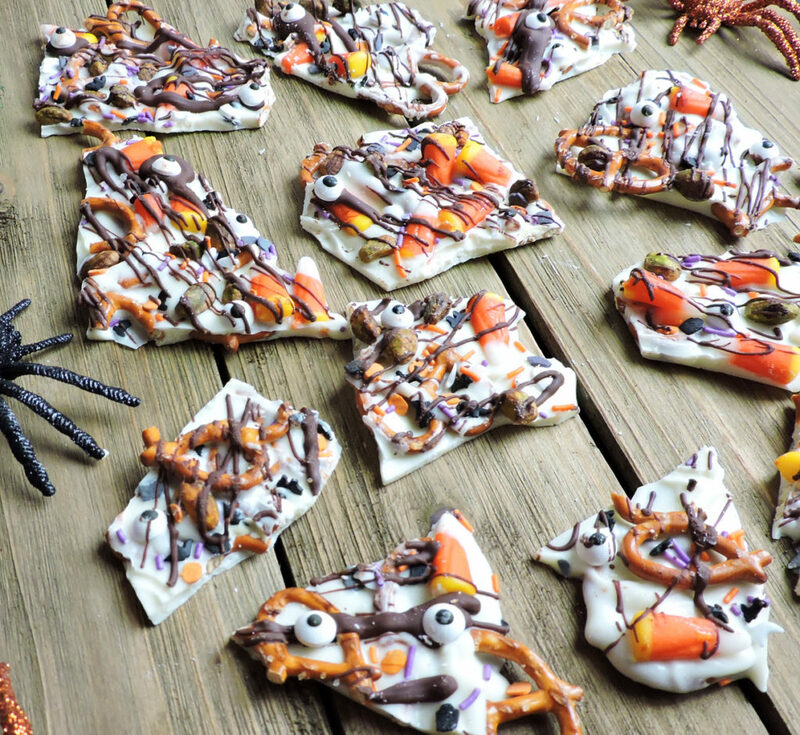 For these tasty treats, I wanted to add a spin on the popular Halloween Bark and add pistachios! My kids love nuts, so I thought it would be fun to add those in! Pistachios provide so many wonderful benefits such as helping to keep our hearts healthy and boosting our immune systems! So the next time you get the sniffles, just run out and buy a bag of pistachios! I’m totally kidding about buying a bag of pistachios to cure your sniffles, but not about the wonderful health benefits! ? Try these delicious treats for yourself! I must warn you…these treats are SO addictive! 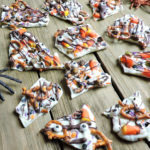 I think I ate more Halloween Pistachio Bark than my kids lol! Line a baking sheet with parchment paper and spread pretzels on top. Set aside. In a small microwave safe bowl, place white chocolate morsels in the microwave for approximately 3 minutes. Be sure to stop microwave to stir chocolate every 30 seconds until chocolate is completely melted. Add coconut oil to melted chocolate and stir to fully combine. 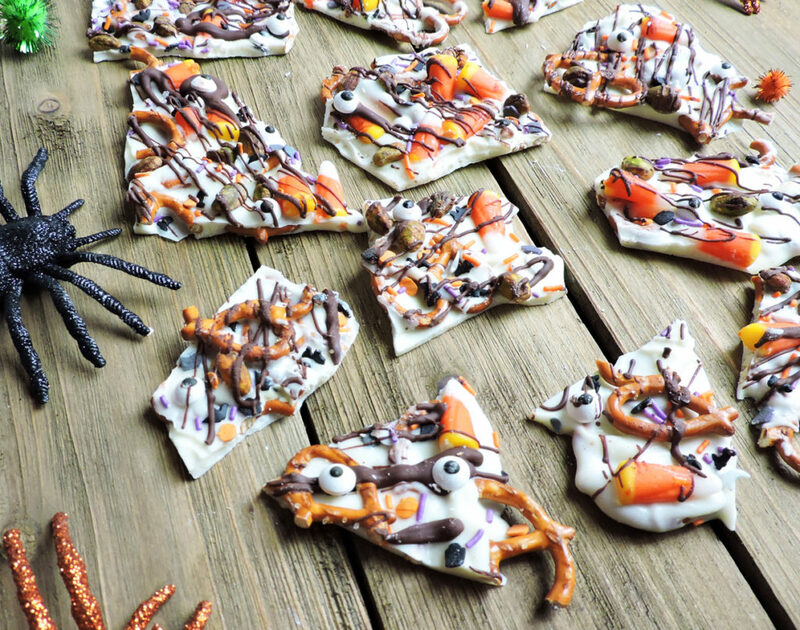 Spread melted chocolate over pretzels and use a spatula to spread mixture evenly. Sprinkle candy corn, pistachios, sprinkles, and candy eyes on top. Place in refrigerator for approximately 30 minutes to an hour, or until bark is firm. Remove from refrigerator. Melt milk chocolate morsels in microwave and drizzle on top of bark. Place in refrigerator until milk chocolate drizzle hardens. Break into pieces and enjoy!